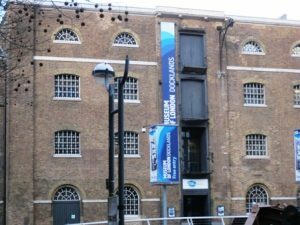 The Museum of London Docklands occupies a Grade I listed 19th century warehouse on West India Quay near Canary Wharf. The museum documents the history of the River Thames and London’s docks from the founding of the Roman settlement of Londinium to the demise of the working docks and the subsequent regeneration of docklands. The museum is large and provides a comprehensive overview with historical artefacts, pictures and models including a recreation of a historic alley and quay and a scale model of the old London Bridge. There are interactive exhibits for children and a play area and cafe are located on the ground floor.